Mount Tianshou or translated in English as " Heavenly Longevity " is an excellent geomancy site surrounded by hills and facing a vast basin of water. 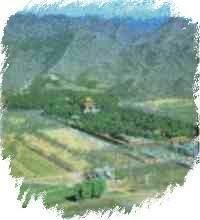 This location was chosen as the burial site of Ming Emperors and their families. The vast North China plains is on it's south side where the South Mount Dragon and Mount Tiger is said to be in harmony with each other.